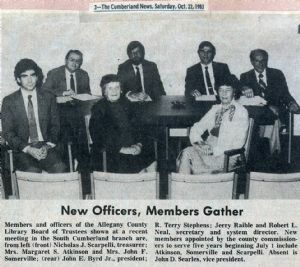 Members and officers of the Allegany County Library Board of Trustees shown at a recent meeting in the South Cumberland branch are, from left (front) Nicholas J. Scarpelli, treasurer; Mrs. Margaret S. Atkinson and Mrs. John F. Somerville; (rear) John E. Byrd Jr., president; R. Terry Stephens; Jerry Raible and Robert L. Neal, secretary and system director. New members appointed by the county commissioners to serve five years beginning July 1 include Atkinson, Somerville and Scarpelli. Absent is John D. Searles, vice president.